The only comprehensive history of WestConn written by Professor Herb Janick. Janick was an urban historian who specialized in Connecticut history and spent over thirty years teaching history at WestConn. Janick, Herb. 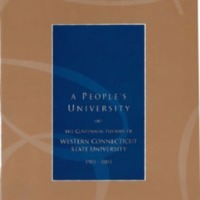 “A People's University.” Western Connecticut State University Photographs and Miscellanea, RG8. WCSU Archives, 23 Aug. 2018. Accessed on the Web: 21 Apr. 2019.